sMelanoma, cancer stinks! : Proof that the "Cancer Industry" exists! By now you have heard someone say that there is way too much money in the "Cancer Industry" for a cure to be found. Treating cancer is far more profitable than curing cancer. 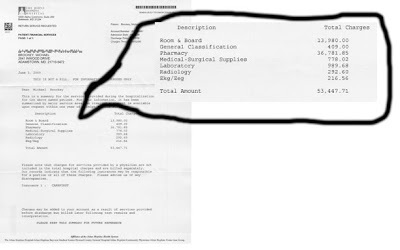 Here is the bill that my insurance company just received for my 5 day treatment. $37,000 for the drugs alone! Wow! This is big business. This place is soo busy that I am sitting at home on a waiting list for a bed to come available. There are at least 3 wings of this hospital dedicated to IL-2 and other types of cancer treatments. Money is just pouring into that place! Interesting Mike. First off, I just started following your blog and went back to day one to see where and how you started this journey. I started my met. melanoma journey last December. I have followed a similar path, but was unaware of the Gerson Therapy. Thanks for that.